Beautiful, beautiful, beautiful!! Beautiful language, beautiful illustrations. We fell in love. And discovered lots of nautical and sewing terms we were clueless about. I didn’t care for the text of this book very much, but thought the illustrations were truly superb. The idea and message behind the story were enjoyable, but the nautical metaphors were heavy-handed and the text was lengthy and dense. A lost seamstress washes up in a lonely, dull village. She agrees to make only plain clothing for the villagers in return for charity, but she can’t suppress her creativity and imagination for long. Her outlet is the pockets she puts in each garment, heavily embroidered and decorated. These pockets become windows to the world for the villagers. The illustrations by Mary GrandPre lightened up the heavy story. As with Sweep Dreams, the pictures have clear, bold shapes that are round and rich. For this story, she uses line to create the illusion of embroidery. The color is bold here, too; rich jewel tones throughout the illustrations get brighter as the villagers lose their dull thoughts and broaden their horizons. GrandPre’s use of value adds a depth to her illustrations, as certain parts of each picture pop out of darkness. The illustrations fill the pages and flow effortlessly around the text blocks: this book is more successful than Sweep Dreams in layering the text over the illustrations. GrandPre continues to use perspective well, zooming in on the changing faces of the villagers, zooming out to show the village as a whole, and just in general creates beautiful artwork to tell this story. It’s a shame the words don’t match the illustrations. From the opening lines (“A slim schooner of a woman, driven by strong winds and a broken heart, floundered barefoot across the eastern plains until arriving at the edge of a village”), the reader is drawn into a curiously juxtaposed world in which nautical terms are used to describe a prairie setting. It is a juxtaposition that works, thanks to the combination of Armstrong’s lyrical text and GrandPré’s dreamy illustrations. The sea and sewing provide a metaphor for imagination, richly developed in Armstrong’s choice of words. Adjectives and nouns give the text a maritime flavor, but it is the use of nautical verbs at every opportunity (“The plains around them swallowed color and drowned it, and the village itself drifted sadly, a sunless island”) that truly brings the metaphor to life. GrandPré’s illustrations portray equally well the drab life of the prairie folks and their subsequent transformation through the stories unfolding inside their pockets, a transformation made magical by GrandPré’s swirling colors and shining visions. 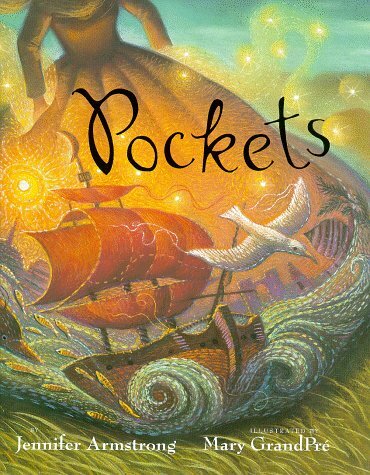 Pockets is a beautiful addition to any collection, sure to inspire hope and dreams. Pockets is the story of a seamstress who finds herself blown up on the fringes of a village, much like a ship blown upon a shore. The people of the village ask her to create drab, sturdy gray clothing for them, and she does for a while, but she has an urge to create beautiful things, and so she begins to embroider wonderous things inside the pockets of her own clothing, and then inside the pockets of the clothing she makes for the villagers. What happens then is purely magical.There is a lot of ship, sea, and traveling imagery in this book, both in the pictures and the words. The paintings are stunningly beautiful, and they evoke a sense of wonder and imagination. They're also painted with strokes like stitches, so they evoke the embroidery the story talks about as well. This was a gorgeous book, and I'm super excited about finding it. A mysterious woman in fancy dress is taken in by a town that insists everything be dull: "the plains around them swallowed color and drowned it." She makes her living by the only thing she knows: mending and sewing clothes. After a time, she turns her own pockets inside out, and lets her fingers fly- embroidering pictures of hidden worlds and imagination that she can enjoy in secret. But she can't stop at just her own pockets....A special story, enhanced by the glowing illustrative style of Marie GrandPre. More of Jennifer Armstrong's lovely writing. This is writing requiring visualization of the art and settings she creates -- a little bit different and asking a little bit more from young readers. Beautiful ideas, a lot about transformation. Very enjoyable and not less so with the perfect illustrations of Mary GrandPre. "A slim schooner of a woman, driven by strong winds and a broken heart...." This book is inspiring as much as it is poetic. It is amazing what you can do with a pocket full of wonder. One person can change a village one pocket at a time. I really connected with this one. Fabulous illustrations and an interesting story made up for a difficult narrative that introduced many words our girls (or even I) had never heard before. It was an engaging and somewhat melancholy story that was brought to life by the vivid pictures. I found great delight in reading this book, but actually never read it to Reason. I was enthralled by the lavish illustrations and the concept of the story. A beautiful book to peruse, especially on a gray-feeling day. The story is long and complex, but beautiful - it's packed with vocabulary words that even adults will be challenged by. The illustrations by Mary GrandPré are dynamic and rich. An interesting book for readers who like a lot of color and fantasy. This book has the most amazing illustrations! It is one of my favorite children's books, although I think it's a bit wordy and that the message is probably over most kids' heads. The story explores finding beauty in unexpected places and joy in simple everyday things. A mysterious woman shows up in a drab, hard-working town and is hired to be the tailor. To make up for the drabness of the town, she embroiders elaborate scenes inside peopleâ€™s pockets, opening their eyes to possibilities beyond their own dull existences. An inspirational story about bring a bit of beauty anywhere. Armstrong uses a lot of tough terminology. I found myself skipping a lot of her descriptions so I didn't lose the kids' interest. Beautiful pictures and a great moral. I liked the premise of the story, just that there are a lot of words that would need explaining to 3 and 4 year olds so I don't think that it would be the best bedtime story for that age range. Although I do have to say that the interesting pictures and vivid colors would be enough to go on. The illustrations alone are reason enough to take a look at this picture book! I think the story is beautiful and certainly one that cheers me up when things in life get me bogged down. The illustrations give this book a magical feel, while the text reminds us that one person can make a difference. Illustrations were amazing - story was too wordy for a childrens book. A seamstress in a new town in forced to make plain clothes. After a while she starts embroidering the inside of pockets to bring a little beauty into her life. Soon the townspeople begin to change. Armstrong weaves a beautiful story of everyday magic and inspiration. Coupled with Grand Pre's phenomenal illustrations, this has quickly become one of my favourite picture books! Beautiful story told primarily through the illustrations, done by Mary GrandPres, the illustrator for the American Harry Potter books. Love the story and the illustrations! Jennifer Armstrong Mary GrandPré - Jennifer Armstrong learned to read and write in Switzerland, in a small school for English speaking children on the shores of Lake Zurich. The school library had no librarian and no catalog – just shelves of interesting books. She selected books on her own, read what she could, and made up the rest. It was perfect. As a result, she made her career choice – to become an author – in first grade. When she and her family returned to the U.S. she discovered that not all children wrote stories and read books, and that not all teachers thought reading real books was important. Nevertheless, she was undaunted. Within a year of leaving college she was a free-lance ghost writer for a popular juvenile book series, and before long published her first trade novel, Steal Away, which won her a Golden Kite Honor for fiction. More than fifty additional novels and picture books followed, and before long she also tried her hand at nonfiction, winning an Orbis Pictus Award and a Horn Book Honor for her first nonfiction book, Shipwreck at the Bottom of the World. In late 2003 she will travel to the South Pole with the National Science Foundation to do research for a book on ice.